I haven't seen any layouts of this one around so thought it would be good to add to the collection. I have done this with a 3 position switch so in one position you'll have silicon diodes, in the other postion you'll have germanium, and in the centre off position it will remove all clipping diodes from the circuit. i just built this one today and it works well and sounds very good, so you can verify it. the diode/clipping switch doesn't change much between the silicons and 'none' unless you have the volume cranked. i believe that the original has one 1N34A and one 4148 on one side for asymmetrical clipping on that side. i built the external pregain version and the pot works backwards (CCW is more gain) so i reversed the wire from pregain 3 to pregain 1 and it works properly now. the volume control also works backwards so i did the same thing on the volume pot (i.e. switched volume 3 to volume 1). IMO, you'll get a better taper if you use an audio taper pot. i like it best when the clipping (diodes) switch has one 1n34/1n4148 and on the other side four 1n34's (each set in series). that way there's a lot less of a volume jump between all three settings. 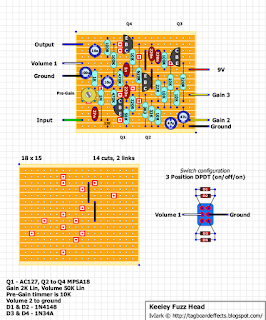 yeah, i just looked at the original Keeley schematic and he has only two clipping settings ( but i prefer 3). one of his is with no diodes, and the other just grounds the 4148 and 1N34A. to raise the gain (volume), i replaced 50K volume pot with a 100K audio one and then added a 500K master volume pot on the ouput of mine so that i can crank the volume pot to drive the diodes harder and still have control of the overall output level of the pedal. BTW, the FuzzHead also sounds really good running on 18V so i built a charge pump for mine so i can select between 9 and 18V. at 18V it has a little more low end, a smoother distortion and a little better dynamics. Please can u just make a sckach on your basically 4 knob version? Because I found everything you say true, making this project and I believe that with this mod will sound even better. Hey mark, you might want to correct the vero. on the DPDT it still says 'Volume 3' and it should have also been changed to 'Volume 1' it might be confusing to someone if they went to build it. would you mind telling me how you hooked up the charge pump? 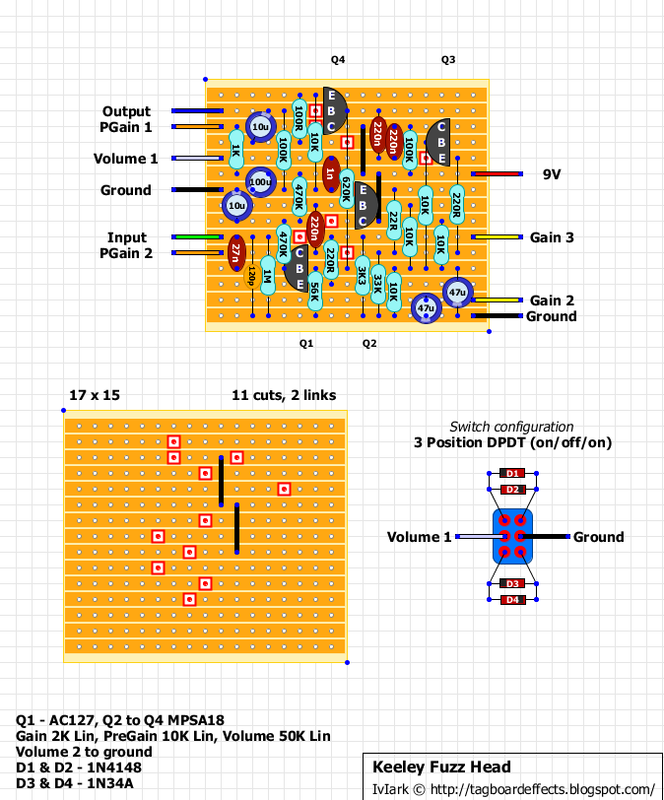 I found a schematic for one online that has a 9v in, ground, ad 18v out, but how do i wire this into the pedal? Mark has an excellent 7660S charge pump vero on this site. 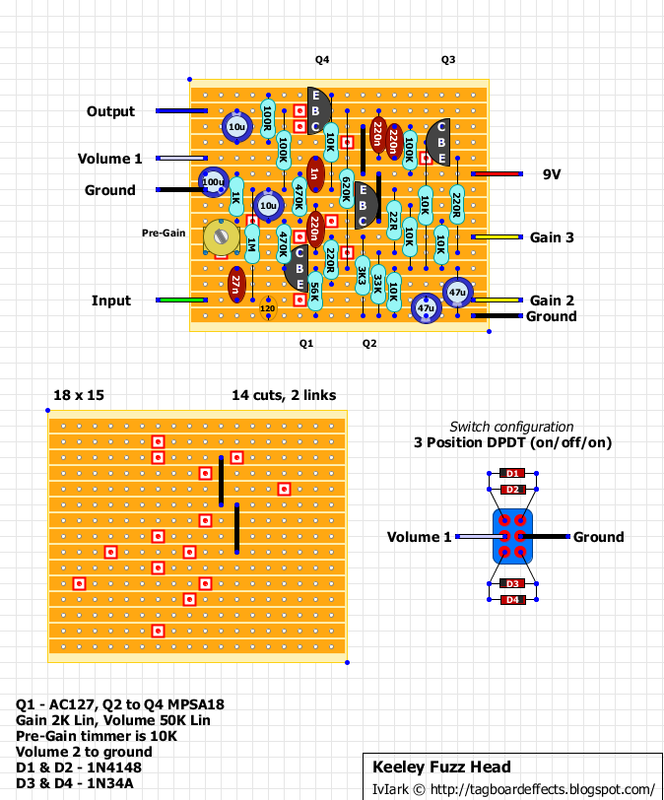 all you do is run 9V into it and then run the 18V out into where the 9V in on the fuzz head board was. thx but how would i wire a switch so that i could toggle back and forth between 9 and 18v? just use a SPDT switch. so would it look like this? when i first built it, since i didn't have any AC187's on hand, i tried a NOS AC127 and an NTE 103A (their cross ref for an AC127 or an AC187) and they both worked well, but i preferred NTE's germanium 101 over their 103A. i finally bought and installed an actual NOS AC187 for it and i like the AC187 the best (but to me, it's only slightly better than the NTE 101). I got a bunch of AC176 Ge NPN trannies. What should I look for in order to get them close to the AC187 specs? lower hfe? any ideas what the difference is between the two? I buy enclosures that are already powder coated and then use a brother p-touch to label them. it's called a Fresnel lens and I get them from mouser. the clear ones are part # 593-3000C. they also come in red, blue, green and yellow. Does the p-touch make white color labels? Like the labels you used on your enclosure, they are white. Does it have a white ink or something? My comment from few days ago diapered somehow, my computer is not quite well at work so I'll ask you again: Please provide a link for buying germanium transistors for good prices I have trouble finding them. Thank you all! Don't you just hate it when your posts diaper? Read this master post on pot tapers et al. http://www.geofex.com/article_folders/potsecrets/potscret.htm See what you can do with that! Interesting information of course, but I can´t find the answer to my question. A paralleled resistor between cw/ccw lug and wiper changes the type of the taper, e.g. from linear to logarithm. 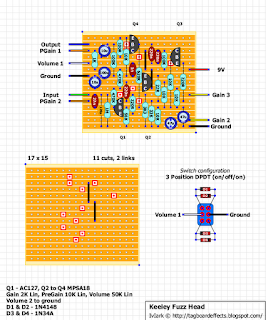 In the layout the gain pot is a simple variable resistor I think, so adding a 1K resistor in series before or after pot doesn`t seem to work because so there is always the minimum resistance of the 1K and so the pot wouldn`t work as it should I think. Maybe the 1K pot does the trick insteed of the 2K pot? Thanks for pushing me in the right direction. That's ok, I wasn't too sure myself. I usually look to that guide if I can't find the exact pot I want right away. I reckon just try the 1K pot and see how you go. If you put a 1K resistor before hand you would only get a minimum of ~1K which wouldn't be ideal. Is one strictly for the switch? Or do both run to ground as usual and the switch runs to a ground off board?